Andrea Humphrys commenced her career with the Australian Federal Police (AFP) in 1981 and has over 37 years’ experience in law enforcement. Andrea has extensive investigative and leadership experience encompassing international narcotic trafficking, organised crime, major fraud, sexual exploitation (servitude and slavery) and online child sexual exploitation. Andrea also spent 7 years as a surveillance operative. Andrea has undertaken civilian police deployments to United Nations Missions in Cyprus and East Timor. She was also attached to the International Police Security Team at the Atlanta Olympic Games in 1996. Andrea has led many successful operations carried out in conjunction with the AFP’s international partners as well as domestic stakeholders; in particular, the disruption of criminal syndicates involved in commercial quantities of narcotics importations into Australia and syndicates involved in trafficking of women for the purposes of sexual exploitation. Andrea spent 4 years as the Australian Federal Police Liaison Officer to North America based at the Embassy of Australia, Washington DC, USA. Since returning to Australia from her deployment to the USA in January 2012 Andrea was based in Sydney where she performed duties in the Crime Operations portfolio and Airport Police Commander at Sydney Airport. In January 2017, Andrea was deployed as Senior Police Liaison Officer, based in The Hague, Netherlands. Her team has responsibility for Australia’s law enforcement relationship with 19 European countries. Andrea holds a Bachelor of Applied Science (Human Movement / Physical Education), and a Diploma of Technical Engineering (Locksmithing). Andrea is a graduate of the AFP’s Management of Serious Crime Program, completing the first international MOSC course held in Singapore in 2001. 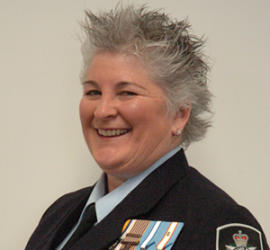 Andrea is a life member of the International Association of Women Police (IAWP). She is currently the Executive Director of the IAWP and was a Regional Coordinator between 1999 and 2010. Andrea was awarded the Australian Police Medal (APM) in the 2017 Australia Day Honors for her significant contribution to Crime Operations and International Policing. Andrea has a love of travel, cooking, gardening and yoga. Her travel hi-lights include the Arctic Circle, the Trans-Siberian Railway and spending time with a family of gorillas in Rwanda.